If you have an incomplete smile, you may find it hard to be one hundred percent confident in the way you look and in the way you present yourself to others. Many people consider a smile a first impression, and not being confident in the way you look definitely has an effect on the way you interact with others. Having teeth missing from your smile can make a big impact on your oral and bodily health, and Dr. Gary Klugman as well as Dr. Christina Bianco are able to give you the full smile you have always wanted with the use of crowns and bridges. A crown, also known as a dental cap, is placed atop an existing tooth as to prevent it from any further harm or damage. Looking exactly like natural teeth, crowns are able to give you a healthy, beautiful smile without looking unnatural. There are many reasons why someone would need a crown, such as a cavity that as gone awry and a filling would not be able to take care of the issue. Crowns are also excellent for cracked or fractured teeth, after root canal therapy, or to keep a fixed bridge into place. 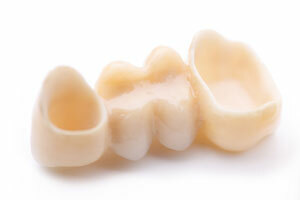 Bridges are used to replace a missing tooth, or a row of teeth, kept in place by crowns affixed to remaining teeth. The important thing with bridges is that you must have healthy, stable teeth to act as anchors to keep the bridge properly in place. Because bridges are not able to be moved, you do not have to worry about it moving out of place, being able to enjoy the security of your smile at all times. If you are curious about crowns and bridges and how Dr. Bianco or Dr. Klugman can help give you a great looking smile in no time, please contact our office and make an appointment! We would love to see you, and will be more than happy to help!